It's Yee Weng on Tie-Break! 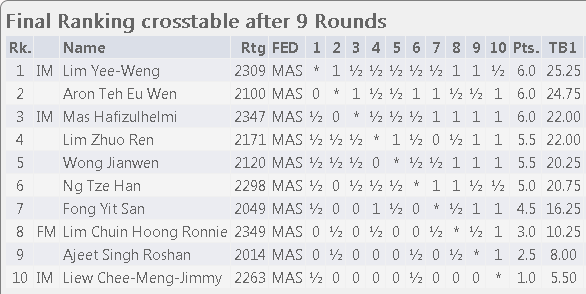 In the end it was Lim Yee Weng on tiebreak over Aron Teh and Mas Hafizulhelmi when all the leaders could only drawn their last round games. Yee Weng understandably took a quick draw against Mas but then it was a long wait for the game between co-leader Aron and Ronnie Liu. Ronnie played sensibly for once and pressed without too many risks but in the end Ronnie decided not to gamble and accepted the inevitable draw. 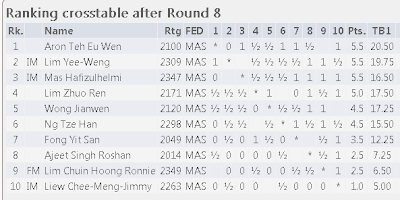 With one round to go, Aron Teh, Lim Yee Weng and Mas Hafizulhelmi continue to share the lead on 5.5/8 in a hard fought event. Aron is certainly with the best chance as he plays the off form Dr Ronnie Lim while Yee Weng and Mas play each other and Lim Zhouren who is on 5/8 and half a point behind will be hoping to win his last round and benefit from any slip up by the leaders. It is clear that veteran Jimmy Liew will be last - sometimes your age just catches up with you - and it will be interesting if Roshan Singh who plays Fong Yit San can keep his eighth place and qualify for the National Team as the seven players ahead of him, assuming no withdrawals due to work or other priorities/commitments, have already booked their places. Once the national team is formed players would be required to commit to being available for international representation and to play and train regularly as in other sports and in line with what is expected from the Minstry of Sport, National Sports Council and Olympic Council of Malaysia. It will certainly be a tense and exciting afternoon/evening for the very best players we have available and playing today! With a dominant display where she led from start to finish, Camilia Johari has now won the biggest prize of all - the first Malaysian Women Masters! The top six finishers are now officially our national team. After the third day of play, 14 year old Aron Teh has taken the lead with a stunning upset of a clearly out of sorts Mas Hafizulhelmi and now has 4/5. 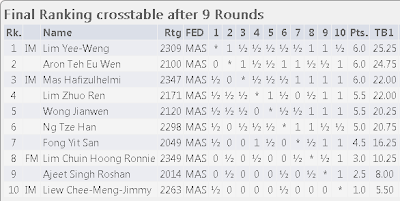 In joint second and third places together with Mas is the also unbeaten Lim Yee Weng with 3.5/5. Wong Jianwen has seemed to have curbed his aggression and is learning to making draws now, the benefits perhaps which can be seen from being in fourth place with 3/5 while Lim Zhouren is not trying to win every game too after failing to convert against Aron and then blundering badly against Fong Yit San. As a result Zhouren is on 2.5/5, a 50% score, the same as Ng Tze Han, and half a point better than Yit San who clearly still has all to play for. Defending champion Roshan is paying the price for a year of inactivity and has carried his indifferent play over from the Selangor Open and the ASEAN+ Age Groups but has showed glimpses of his talent and today would have been a good day for him after starting with three losses as he has now scored 1.5/2. Top seeded Dr Ronnie Lim also started the event trying to win every game but it was only in the fifth round that he recorded a win and with three losses to date and four rounds to go his chances are very slim indeed. Camilia Johari has led from the first round and on 4/5 is in the drivers seat. 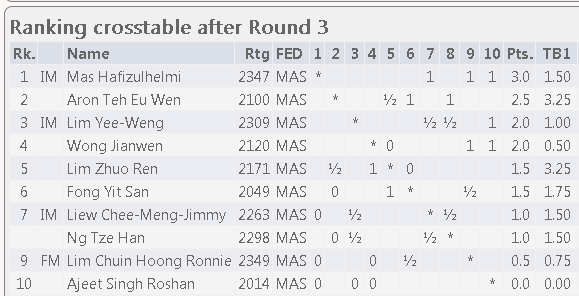 However, even with two rounds to go Nur Nabila Azman Hisham on 3.5/5 cannot be counted out. 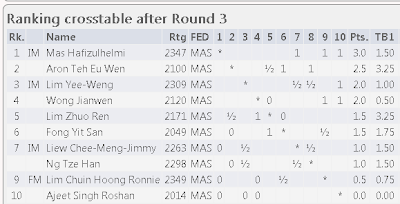 On 3/5 both Fong Mi Yen and Puteri Rifqah Fahada Azhar still have a good chance, especially the latter who is really on 4/6 as she has not yet gotten the bye and so her remaining game with Camilia will be essentially the decider. Tan Li Ting who is in fifth with 2.5/5 is also going to get a bye so is really 3.5/6 but her fellow Istanbul Olympiad team mate Nur Najiha must be shocked to be on just 2/5 and without a win. 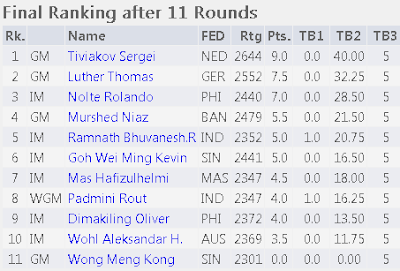 After three rounds IM Mas Hafizulhelmi remains perfect with 3/3 with young Aron Teh in second place with 2.5/3. Of course with a round robin positions can change quickly and it is quite early days yet with six demanding rounds over three days to go. No one is perfect in the women's section but Camilia Johari is the only player yet to lose and so leads with 2.5/3 with Nur Nabila, Fong Mi Yen and Puteri Rifqah all close behind with 2/3. There is only six rounds with the no show of Alia Bakri although there will be seven rounds withe each player enjoying a bye. DYTM Raja Dr Nazrin Shah Ends With Malaysian Masters in Full Swing! The last round of the DYTM Raja Dr Nazrin Shah Invitational Masters will begin at 11 a.m. followed by the closing ceremony. Both Wong Jianwen and Nithyalakshmi Sivanesan largely dominated their rivals to win the final two qualifying places in the Malaysian Masters which will be from 22-26 June (Men) and 22-25 June (Women) respectively. The first round of will be held at the Palace of the Golden Horses beginning at 11 a.m. on 22 June but subsequent games will be played 9 a.m.-1 p.m. and 4-8 p.m. daily at Swiss Inn. So that the players have a chance to prepare, the lots been drawn and the pairings have been posted at http://chess-results.com/tnr104193.aspx?lan=1 (men) and http://chess-results.com/tnr104173.aspx?lan=1 (women). Final two places in Malaysian Masters are up for grabs today - one for men and one for women. Wong Jianwen or Muhammad Syazwan Zulkifli? Nithyalakshmi Sivanesan, Jessica Augustine or Nur Sabrina Aliya Asman? Its all happening at Swiss Inn in KL's Chinatown. Today Thomas Luther had a bye so after the round started he invited me for a coffee. And he handed me a gift from a mutual friend Heinz Brunthaler. A couple of years ago I was supposed to collaborate with Heinz on some chess books but it never happened because I simply could never find the time and now it seems that Thomas will try to do what I so miserably failed at. No, Heinz did not give me his book with Quality Chess but that and the something else he did give me got me thinking again of parents in chess and especially now that I am in the Malaysian Chess Federation (MCF) as both FIDE Delegate and Chairman of the Technical Committee (I am lucky as our Secretary here, Lim Tse Pin, actually does all the heavy lifting) especially of those who are parents, whether successful or not at seeking office, of young chessplayers with really quite varying abilities. 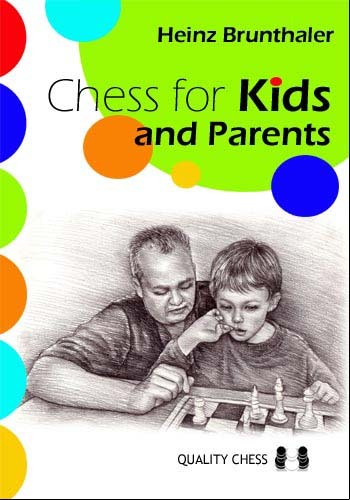 If you are in chess, especially now with numerous national and international youth events together with a supporting ecosystem in place, you can't avoid them as every young chessplayer must have a parent (or at least a guardian)! But there are two categories of chess parents whom I find a little alarming sometimes but who can blame anyone over their little darlings? Of course they don't know (or at least can't allow themselves to know) but I have in the last two years witnessed at first hand some simply unimaginable behaviour and I think for me the line is drawn when the actions are at the detriment of others, be it a rival, a team mate, or even as they call it, resulting in collateral damage. The Malaysian chess community is small and often bad behaviour is rewarded by default as it is tough for those who are in fact chessplayers and holding office/position in MCF or even a state affiliate to act because they are also often doing some form of chess for a living (having invested in this as a career or in for the long haul) and so don't really want to make an enemy of this transient but possibly vindictive someone (especially if rich or a fellow office bearer). So let me quickly end this dangerously developing train of thought with the need to do right by the child because at the end of the day all parties, parent from hell included, will claim they have his or her interests at heart and I will quote the exact but sad words of a respected trainer: "Parents are our greatest help, and our greatest hindrance (as a famous American swimming coach once said)". But I should still add the uniquely Malaysian twist to that by saying that here it is all too obvious that: "Everyone is an expert". Because it seems that we really really really like ourselves. And now I have to wait to see how many that I never even thought of will think I am talking about them (ego, guilty conscience?). Perhaps the recent National Closed Championship or the ASEAN+ Age Group Championships, possibly even the coming Malaysian Masters will be a sore point with them? Who knows? Yes, I am talking about Mas Hafizulhelmi. From 13-21 June he will be playing 10 games in 8 days at the DYTM Raja Nazrin Shah Invitational and then without break be defending his title with 9 games in 5 days at the Malaysian Masters (National Championships Final). 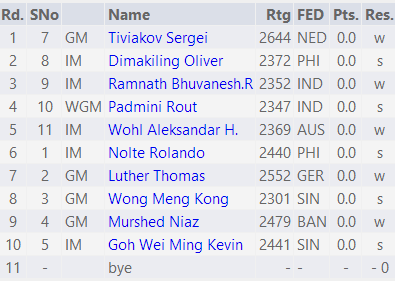 That's 19 classical FIDE title and rated games in 13 days. It is serious competition indeed for the University Olympiade coach as can be seen below in facing four GMs, five fellow IMs and an equally rated WGM world champion holding numerous IM norms! Playing the very best of our locals immediately after such an event won't be easy either with fellow direct qualifiers IM Lim Yee Weng eager to show off the fruits of hard weekend games in Singapore, IM Jimmy Liew still trying to turn back the years, FM Ronnie Liu out to stop being the nearly man in recent times and Ng Tze Han looking to continue to build on his string of good if not spectacular results. 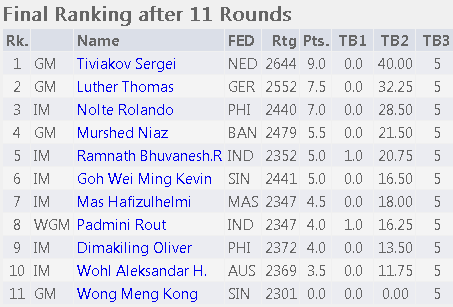 Roshan Singh who missed out on the Olympiad after winning one of the most one sided national championships last year is beginning a slow return to chess while Lim Zhouren will want to prove that he is a worthy replacement for Mok Tze Meng and that his IM norm in Istanbul was no one off result. Aron Teh, Fong Yit San, and either Wong Jianwen or Mohd Syazwan will also want to show they belong in this company and the enthusiasm of youth can never be discounted! The DYTM Raja Dr Nazrin Shah Invitational Masters will be held at Swiss Inn, Kuala Lumpur from 13-21 June 2013 and at the Palace of the Golden Horses together with the start of the Malaysian Masters on 22 June 2013. A total of 11 players from 8 countries comprising four grandmasters, six international masters and one woman grandmaster will vie for honours and bragging rights. Last year's KL Open Champion Sergei Tiviakov is the top seed but is expected to face a challenge from second ranked Thomas Luther and fellow veteran's Niaz Murshed and Dr Wong Meng Kong, while our own Mas Hafizulhelmi leads a large group of grandmaster title and norm candidates including Kevin Goh Wei Ming, Rolando Nolte, Alex Wohl, Oliver Dimakiling and Ramnath Bhuvanesh. The single female participant is the returning multiple World Youth Champion Padmini Rout whose team recently emerged champions at the chess equivalent of the IPL (India Premier League). With 11 players, there will be a bye each round. Games at Swiss Inn will be from 4-9 p.m. daily with additional games 9 a.m.-2 p.m. on 16 and 20 June to allow for a rest day on 17 June. The final round will be 11 a.m.-4 p.m. on 22 June at the Palace of the Golden Horses to be followed immediately by the closing ceremony to be graced by DYTM Raja Dr Nazrin Shah with Malaysian Chess Federation President Tan Sri Ramli Ngah Talib expected to also be in attendance. 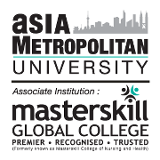 Once again this event is organised by KLCA and made possible with sponsorship from the Masterskill Education Group Berhad and its affiliates. The Masters - Who Will Qualify? All attention is now shifting to the Malaysian Masters where our top ten men and top eight women players will seek to establish themselves as members of the national team to the coming SEA Games, Asia Nations Cup and World Chess Olympiad. There were three places up for grabs for the men and Aron Teh and Fong Yit San, by virtue of taking clear first and second places are automatic, while Wong Jianwen and Muhammad Syazwan Zulkifli will have to play off for the remaining slot. It has been a good run for the foreign based Aron as he is coming off a joint first place finish at the World Amateur (for players rated under 2000) and he clearly played a smart tournament to take his chance with both hands even as the other perhaps more fancied favourites largely self destructed and several of these young players would be well advised to take a hard look at themselves if these want to progress. For the women, there were four places up for grabs, a situation mitigated in a small field when the Azman Hisham sisters who had direct entry chose instead to win and qualify! No surprise that Nur Nabila and Nur Najiha took the top two places with some ease and in fact Nabila could afford a surprise last round loss and still emerge the winner. The beneficiary, Puteri Rifquah Fahada Azhar, also qualifies by virture of outright third place, but there will be no less than five girls playing off for the last slot! Congratulations to all - the quality of the games was very mixed (I think!) but everyone will have to salute the great fighting spirit shown (at least that was the impression I got from the men results) as I was not there first hand to witness.